The number of digital nomads, professionals who choose a remote and location-independent career is growing crazy. We prepared a list of the coolest catch ups, camps and conferences across the globe where you can meet like-minded people. It’s time to make your for your future WORK & TRAVEL plans. 6 Apr. – 12 Apr. one of the most popular digital nomad events with over 200 like-minded people on the board cruising to Lisbon. JOIN -> COMMUNITY of 200 DIGITAL NOMADS SUPPORTING KIDS IN AFRICA! The brightest minds of the region come together to discuss the future of CoWorking in Asia. If you are interested in doing something in this field, this is the perfect place for you! Pack returns to Bali for the 3rd year in a row. Why? Because Bali is the paradise on earth. We haven’t met a person yet that would dislike Bali and we are sure you won’t either. African adventure for entrepreneurs, startups, remote teams and digital nomads. Spend 1 month in Marrakech, Moroccos most famous imperial city. It is an unforgettable experience in one of the most magical places on earth. What are you waiting for? Have the time of your life in one of the best spots in the world to Kite and create unforgettable memories. The program is packed with exciting experiences that will make you want to come here again and again. enjoy networking, workshops, talks along with amazing food & all-inclusive. enjoy your stay at a lovely boutique hotel with like-minded people / digital nomads / remote workers from all over the world & experience a spiritual paradise of culture, mountains and yoga. This year the 8th Flaks networking week for sporty entrepreneurs will take place in Tarifa’s most luxurious villa. Join to meet and learn from other entrepreneurs and enjoy life in this kitesurfing paradise. Spend a week sailing and exploring different islands while having parties on beaches and living life to the fullest. Spend a week sailing and exploring different islands around Croatia with like-minded people and community. This 3-week long workation is specially designed for Digital Nomads, Location Independent Entrepreneurs and Change-makers, who are purpose driven and want to make a difference! this is and event for the community of digital nomads and remote workers. Great way to get to know the city with like-minded people and get some work done. Have fun with other likeminded entrepreneurs while learning new stuff and always improving yourself, Flaks is the way to go! DNG Retreat Javea 2016 from Digital Nomad Girls Ltd on Vimeo. Our 4th DNG Retreat! Come and hang out with us for a week of networking, masterminding, skill shares and fun on the Costa Blanca! This is the pinnacle event of the travel media industry. It is a must go for anyone that wants to do anything big in the niche. Network with other like-minded individuals and listen to the keynotes that will blow your mind. If you want to scale a remote company then you definitely shouldn’t miss this event. Some of the brightest minds in the world of remote companies will be gathering together and sharing valuable insights. Prices start at $97 presale! great conference for digital nomads in one of the TOP nomad spots! Talks, panels, workshops, breakout sessions, meetups, and parties.. don’t miss out! Nomad Checkpoint – Playa del Carmen, Mexico – 21 Jan – 05 Feb.
Nomad House – Jaipur – India – 6 Jan. – 4th Feb.
Nomad Cruise is not only a cruise where 200 people board on a boat, it’s a journey of a lifetime. All-inclusive comfort, beautiful destinations and facilities creating environment to share, learn, meet, connect and inspire. Where you can be introduced to 200 like-minded people in just few minutes? Have a look on the list of experts facilitating workshops and you’ll understand why this cruise is so popular between independent entrepreneurs. Big names bring value to your business while you’re having an experience of a lifetime. Nomad Cruise is a community, because the contacts and friendships which start on the boat may have unlimited lasting. Coworkations are inspirational retreats which take place in various destinations around the world. Coworkations connect people who have chosen location independent lifestyle and freedom which comes from a desire to design the lifestyle they want. The trips have different length (from weekends up to 2 weeks) and each of them take in consideration the code of Coworkation. DNX creates a platform for freedom-preneurs who decided to change the conventional job and set up new life with own rules in time schedule, job and life. The DNX speakers are successful internet business owners. Currently, the DNX vibe was spread across more than 4.000 attendees and as the reviews on the official website say, it’s an amazing and inspirational adventure. Each DNX Conference or Camps welcome incredible experts who share their best practices and advice on business and nomadic lifestyle. In September Sunny Office organizes another hang out for a small group of digital nomads from different parts of Europe. An Andalusian escape will take place in a coastal village of Zahora. Freelancers and entrepreneurs will be exploring this beautiful part of Spanish coast for 10 days. Located only 300 meters from the beach makes it a perfect spot to enjoy the best sunsets and sunrises every day. If September it´s too tight date for you, Sunny Office has upcoming events through the whole year. Check out their website for updates. CODINO – is a community for meeting digital nomads and people interested in the location-independent lifestyle with base in / around Barcelona. CODINO organizes meetups, workshops, the “nomad-talk” speaker series, coworking days, mastermind groups and offer workations around Barcelona and other parts in Spain and Europe. CODINO network also cooperate and organize events with other digital nomad international communities, organisations, workations and online-entrepreneur groups coming to Barcelona and Spain. The Entrepreneur House is connecting people who are in the business 2 – 10 years, some of them 10+ years. The month will be filled with activities, such as, private masterminds, presentations facilitated by advisors and more. Rus Huges is one of the many examples how effectively these activities and environment of successful entrepreneurs can boost your productivity and profit. If you want more reasons why you shouldn’t definitely miss DCBKK conference, check out the official website of The Entrepreneur House with profiles of advisors and more updates. 361 entrepreneurs from 32 different countries have joined adventurous trips to 6 different countries organized by Refuga. The mission is to create the world’s best networking experiences, by getting ambitious people together for workations and expeditions across the globe. Among the trips organized by Refuga can be found Kilimajaro, Spain, Costa Rica, Marocco, Thailand – everything from different corners of the world. Find out what fits you the best. Running a business as a nomad definitely comes along with adventurous personality. What would you say for a week or two with like-minded people cruising the ocean waters and stopping in beautiful destinations? Coboat is new concept of coworking camp that brings together community of nomads on board a catamaran and treat them with cured program full of inspirational talks, workshops, skill sessions. Along with business side comes discovering. At anchorages you can get closer to villages, local people, beaches and coworking communities. Obviously, at the end of the day you can’t leave this unusual coworking office. Instead, you interact, discuss and brainstorm with fellow nomadic mates who can enrich you with new ideas or notes towards pitched product/service. Coboat also cares about the balance between work and relax. After you unplug from projects, there are plenty of cool activities that bring community even tightly together. From yoga sessions, scuba diving, movie nights, cooking classes to pitch night and TED talks. The environment of open-minded entrepreneurs force you to think, evaluate, be authentic and share your passions. As many coboaters said, it is incredible experience which re-inspired them, made think about new possibilities and gave them valuable input, feedback and confidence to go on with their projects. Added value of Coboat is a unique mission underlining sustainability and the aim to come up with solutions how to fight the ocean pollution. The boat itself is also designed in order to represent sustainable values – it has electric motors using energy from solar panels. 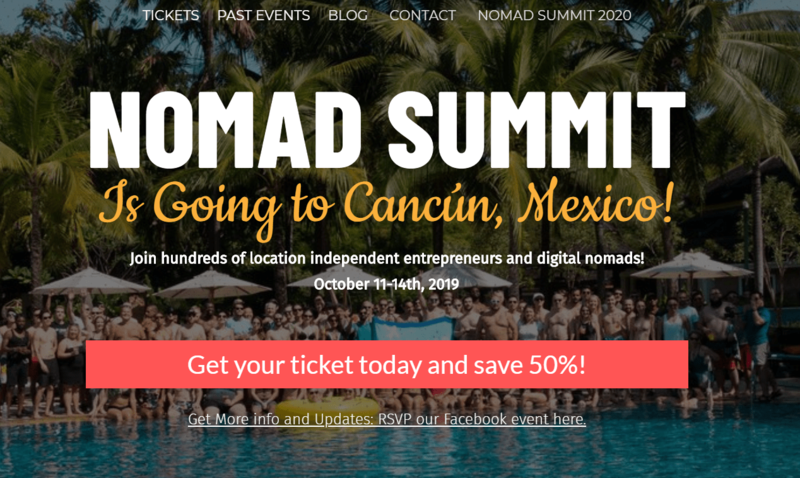 The post 22+ Events & Conferences For Digital Nomads 2019 (UPDATED) appeared first on Traveling Lifestyle.